It’s been quite some time since I’ve posted here, but that isn’t a manifestation of Dante’s apathetic listlessness acedia (often used as a temptation by the demon Belphegor). Rather it’s been a wildly hectic and successful summer for fieldwork. Crews have been working here from the University of Nebraska, University of Utah, Harvard, the American Museum of Natural History, Brigham Young University, and three Geologists-in-Parks via the Geological Society of America. 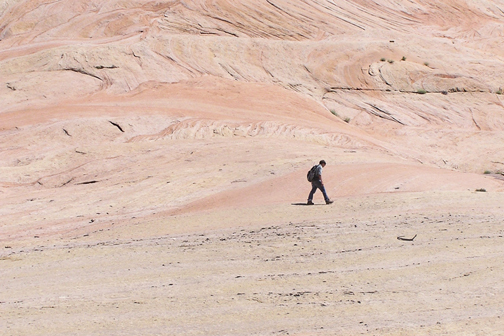 Paleontological and geological research underway is looking at reptile fossil footprints in the Permian Weber Sandstone, the paleontology and paleoenvironments of the Late Triassic Chinle Formation and the Early Jurassic Nugget Sandstone, marine reptiles of the Stump Formation, and the small reptiles, amphibians and mammals that lived with the dinosaurs in the Late Jurassic Morrison Formation. 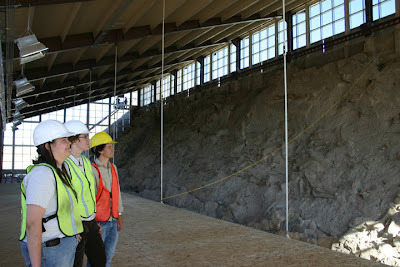 We’ve also been finishing up the exhibits and artwork for the new Quarry Visitor Center. 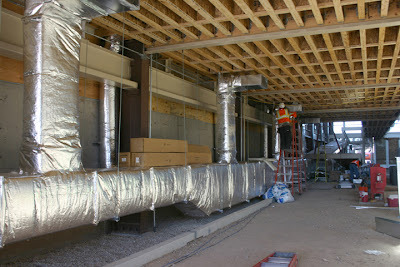 With the opening about 5 weeks away the project is close to completion. The mezzanine is now floored, the railing attached, and it will soon be carpeted. 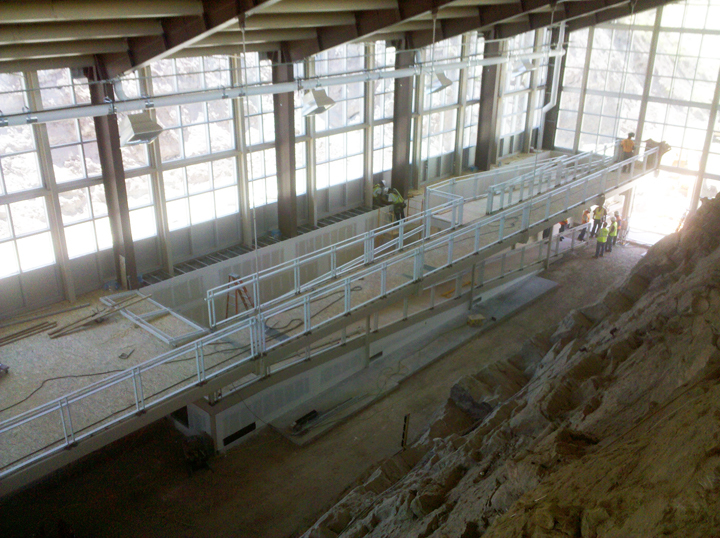 The new mezzanine has been extended several feet closer to the quarry face, giving a closer and more spectacular overview than previously available. 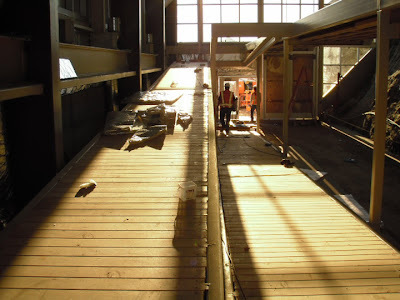 The ramp at the west end has also been floored and will also soon be carpeted. 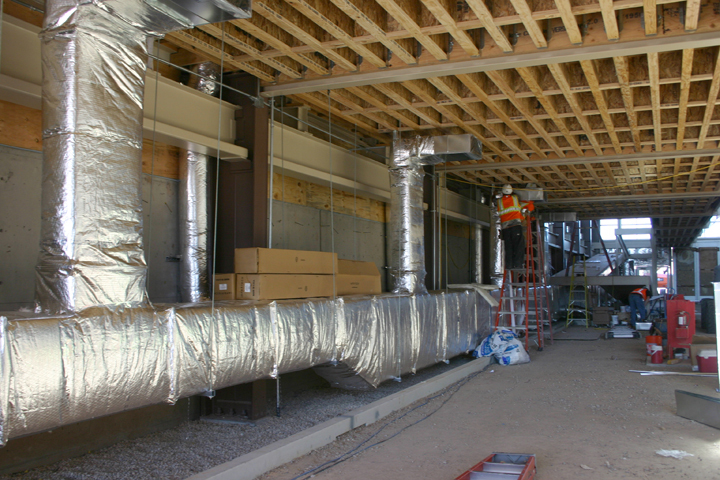 Because of the past problems with the heaving of the cement floor the new building will not have a solid concrete floor pad. Instead, that floor will consist of small, thick paver blocks that will set onto a sand base. To prepare for this, the dirt in the building was excavated down 12 inches, hauled away, and replaced with new fill that was compacted as a base for the sand. 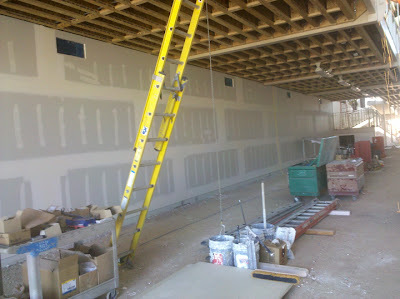 The sand and new floor should be in place in a few weeks. 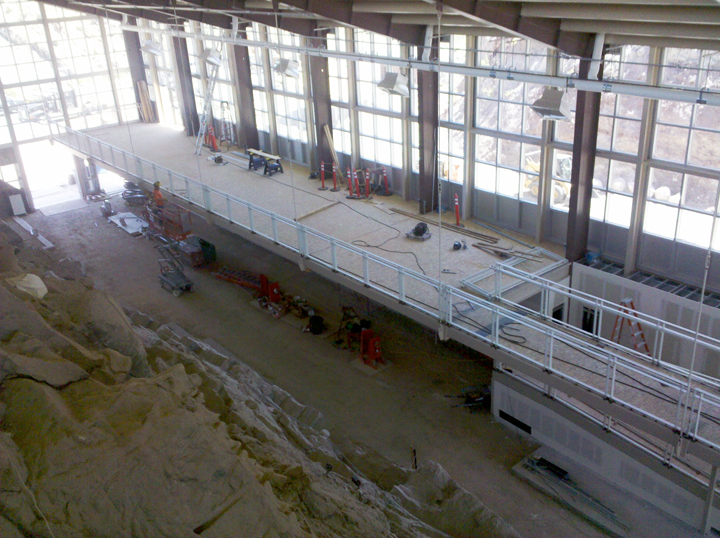 Only a few small concrete pads have been poured and those will be used to anchor specific exhibits. 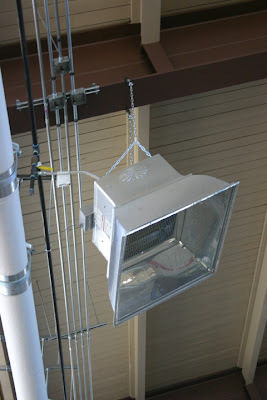 Suspended heating units have been installed above the upper mezzanine. … and is now behind drywall. 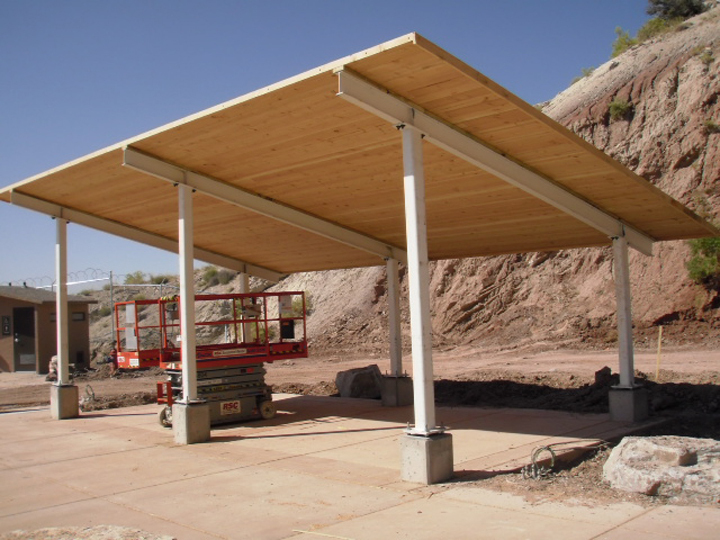 The roof of the shade structure outside the QVC is now in place and resurfacing of the roads and parking lots should be done in a few weeks. 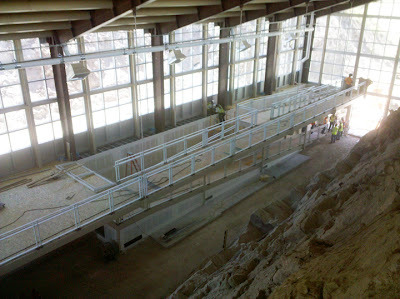 Once the paver floor is installed, all construction inside the QVC will be completed and we will start cleaning the cliff face and installing the new exhibits. 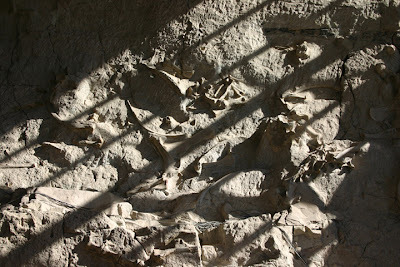 There is close to a decade’s worth of dust on the quarry and covering the bones, making them dull and flat. 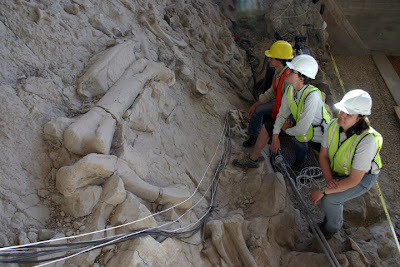 The bones do not stand out in their proper glory, so a good cleaning is in order. More about that later.